As I am about to pour my heart out, I want to start by saying this is the hardest thing I have ever had to write. I write 'had to' because this story needs to be told to help me heal. I need to release it and in a lot of ways let go. For the past year I have tried countless times to sit and type this out, but each time I couldn't. Either the words wouldn't form or I was too overcome with emotion to get anything out. I guess I wasn't ready to share this part of me and this story that has shaped the person I am today as a mother, wife, and woman. Now only a week away from the day that changed my life in so many ways, I feel it is time for the final steps in my therapy and recovery. This is a story James and I have told few people. Of course we have talked about Oslo's birth, but we rarely get into the details and emotions of it. At times the birth still feels like an unhealed wound we are waiting to scab over. Time and therapy has been our friend and we feel stronger today than we have more recently, but like any trauma, it will always be a part of us. Embedded in our roots and our relationship, and is at the base of our journey beginning as parents. Telling this story more publicly feels right at this time, and as my fingers type these words out, strangely I feel more weight being lifted. It's another form of therapy I need to help heal the wound I have carried with me since the birth of Oslo. The birth I wanted and dreamed of was planned out meticulously. I was going to have a home birth with a midwife, in my bedroom, all natural, with James by my side. I imagined myself having one of those hypnotic births, where the baby slips out in a deep breath and the mother scoops him up in her arms, and she cries tears of joy and bliss. I was so excited for it. Weeks before my due date I had prepared my room by writing birth affirmations on paper and sticking them all over my walls. I placed candles to set a relaxing mood, lay a second mattress on the floor, and had my yoga ball ready in the corner. All the boxes were checked to have this so called 'dream birth', and James and I felt prepared, anxious, and happy. I had found an incredible midwife who we really clicked with. She was calm, quiet, and had the sort of energy that I knew I wanted present while in labour. I went to her every month for my check up and she always reassured me, and gave me so much confidence for my home birth. 6 weeks before my due date during my monthly appointment, she told us she had a midwifery training out of the country the week before my due date. James and I felt a bit let down, but she told us not to worry and to find a back up midwife just in case. The problem we were facing with finding a back up midwife that assists in home births was a lot more difficult than we initially thought. Home births are not common in France, and we could only find one other midwife available to help us. She was a sweet woman, but she didn't speak a word of English which made me feel uneasy. We naively pushed forward with our plan for a home birth and thought positively that I wouldn't go into labour when our original midwife was away. But as fate would have it on September 27 at 11:00pm, 7 days before my due date and while my midwife was away, I awoke suddenly with the feeling of cramps. This feeling was sort of familiar to me and almost instantly I knew I was in labour. They were light and bearable so I tried to sleep, knowing I was probably in for a long day tomorrow. James and I both woke up early the next morning and I told him to go to work because I wasn't sure if anything was really happening. He left and I began to time the constant contractions. Finally I gave in to the fact that this baby was ready to make its debut soon after timing my contractions every 5 minutes, lasting between 30 seconds to a minute. I called James around 11:00am and told him he should probably come home now, because it was really happening. He came home and called the new midwife to let her know things were starting, but not to rush over. I felt confident and like I had a handle on the pain, which was still light and consistent. I spent the day with James massaging me, rocking on the yoga ball, lying on the sofa, and going in and of the bath for comfort. As 5:00pm approached, 18 hours into my labour, the pain started to increase dramatically. I could no longer just breath through it. I felt very uncomfortable and that I needed the midwife to come to check me. James called her and she arrived about an hour later. I asked her to check me right away so I could know how much longer I had to go. She told me I was 5cm dilated and that made me happy to know I was half way there, but I was also very discouraged to think I had worked for 18 hours and was only at 5cm. I felt very clinical in my head as she told me, I wanted to know the facts. She tried to get me to stop thinking about numbers and times, and told me to just give into the pain. I couldn't. She tried hard to soothe me, but this woman was a complete stranger and I had a hard time accepting her comfort. It all felt lost in translation, as she had to tell James in French then he had to translate it to tell me in English. It was an unnecessary pressure for James, but he handled himself calmly and was very direct with her instructions. After 2 hours or so the labour was slowly moving, but the contractions were still very consistent. At this point they were every 3 minutes, lasting 1 minute. The pain was now unbearable. I started to have back labour, which was the most excruciating pain in my sacrum, where the hip bones and pelvis are fused together. As I felt another contraction come on, my body would seize up, I would be overcome with a hot flash, and begin to tremble and scream for someone to come and push my hips inward. I was flustered and losing control quickly. James and my midwife tried very hard to get me to breath through the pain, to moan, to let go. I couldn't. It's like I forgot everything I read about natural birth and how to deal with the pain. It all went out the window and all I could think about was how this didn't feel right. I was antsy and went from the bed, to the floor, to the tub, to the yoga ball. I couldn't get comfortable and just wanted it all to stop. I couldn't picture the end or that my baby was coming soon, the only thoughts that flooded my brain were about the pain. My midwife suggested I go in the bathtub because it would help relax. As I attempted to relax in the warm water I felt a sudden explosion. Finally my water broke which really scared me with it's power, but James tried to get me excited that this meant the baby wasn't far from arriving now. Soon after I wanted to get out of the tub and lay feeling helpless on the bed. The midwife suggested her and James leave the room to help me focus on giving into the birth and to take away outside distractions. This was the worst thing she could have done. I felt so alone and frightened. I was upset that they left me and called out for James to come back to be with me. What I needed was support and reassurance everything was fine. Time creeped on slowly and after 24 hours of labour I soon had an urge to push. I was so relieved to have this feeling and to know it was all coming to an end. My midwife checked me and told me I was at 10cm now. In reality she lied. I was actually 9cm but she didn't want to discourage me as she knew I was at my breaking point. So she told me I was 10cm to give me a last push to hang in there. I asked her if I could start trying to push the baby out, and she said I could if the urge was strong enough. I began to get a little excited, and stopped focusing on the pain. I began pushing on all fours, next contraction I tried squatting, the next I went on my back. But nothing felt right and I started to feel exhausted. After about 20 minutes she wanted to check the baby's heartbeat. As she put the doppler on my belly the expression on her face changed and she looked a bit worried. She told James the heartbeat sounded slow and that if I couldn't push the baby out in 10 minutes we would have to go to the hospital. The hospital? No. I never even thought the hospital was an option, I was having my baby at home. I was too close to those final moments. I lay on my back on a mattress on the floor with James by my side and I pushed as hard as I physically could. Screaming with each breath out, trying to get my baby out in time. Time was up. We knew we had to go to the hospital, so James quickly ran around grabbing things we would need. The hospital never entered our heads when we planned the birth, so a bag was never packed. I felt worried, but very calm. I yelled out things for James to pack, like my glasses, toothbrush, and other necessities. He then rushed out of the house to get the car from our parking garage down the street. The midwife helped me walk down the stairs and down the street. I could feel the baby's head right in between my legs and I could barely walk. Another contraction came on in the middle of my street, it was nearing midnight but I didn't care who I woke up. I screamed out in pain and just wanted to make it to the car and drive to the hospital in time. The car ride is a blur and a moment I prefer not to think about. Minutes later we arrive at the hospital and James drops me and the midwife off at the emergency doors, while he scrambles to park the car. We are greeted by a security guard who casually asks us why we are here. I wanted to hit this woman, couldn't she see I was in labour and in an extreme amount of pain? My midwife explains the baby was arriving and I needed to be taken to the maternity ward immediately. The security guard switched on and got me into a wheelchair. James met us and like a scene out of a movie, we all raced down the halls to maternity. A team of midwives greeted us and were surprised to see us there. I was put on a bed, given an IV, hooked up to multiple machines, and the head midwife checked the baby's heartbeat. I was expecting bad news, but she turned to us and said everything is fine, and the heartbeat was normal. I could relax. She told me I was officially at 10cm now and the baby would be here very soon. She spoke perfect English and was so direct with me. I felt relieved and took my first calm breath in hours. I knew I was in good hands and was ready now to meet my baby. 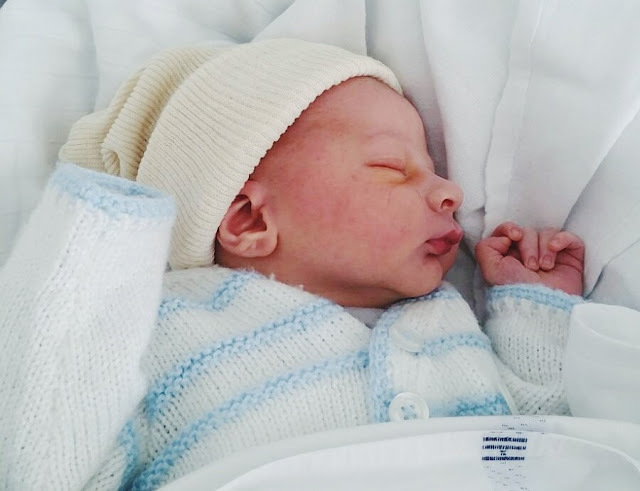 A contraction came on and the midwife ordered James to hold my left leg, my midwife held my right, and I was told to take a deep breath in and push down on my pelvis as hard as I could. I pushed with all my might and it felt right. The pushing was a natural relief. The head midwife was between my legs and looked me straight in the eyes, and told me I was pushing well but I needed to focus more on getting the baby out. After a couple more pushes she told me my baby would be here after two more contractions. I was determined and driven more than I had ever been since the beginning. Her calm confidence was just what I needed. I took one last breath in and pushed with every ounce of my strength. I began to tremble, my eyes were fluttering, I grabbed both my legs, and that's the last thing I remember. I woke up the next day alone in a hospital room, hooked up to three IVs, with machines beeping all around me. A nurse greeted me and explained I had just woken up from an induced coma and I had a baby boy. I was weak and couldn't move, dizzy with emotion, I couldn't process what had happened. James was with the baby in maternity and was notified immediately that I was awake. He rushed down to see me in the ICU, and as he entered the room he embraced me and we both began sobbing. I had so many questions for him about what had happened and about the baby. He told me our baby's name was Oslo, which was the name I had picked if we had a boy. I wanted to meet our Oslo and hold him in my arms, because it didn't feel real yet. My belly was gone, there was no baby inside me, but being told I had given birth didn't make it feel real. The nurse told me I had to wait to meet Oslo because they had to organise with maternity to set up a private room for us to meet in. I patiently waited hours and hours, immobile in my bed. Finally I was told it was time and they hooked up all my machines to portable ones and connected my IVs to the bed. They wheeled me down the hall where I was put into an empty room, halfway between the ICU and the maternity ward. Again I waited, watching through the open door down the hallway, until finally James turned the corner and I could see him wheeling a tiny bassinet with my Oslo inside. So many emotions came over me when I first laid my eyes on the most gorgeous baby I had ever seen. James handed me Oslo and I held him in my arms. I was too weak from the labour and my arms hurt from the IVs so this moment couldn't last long. I was frustrated that these first moments of bonding were impossible to have because of my physical state. I tried my best to enjoy this time, but it was hard to feel like this was my baby and I had just given birth. It felt like they could have handed me any baby from the hospital and told me it was mine. I had none of the incredible natural instincts, hormones, or instant bonding that a new mother gets, especially after having a natural labour. I was left feeling empty, even though I knew I should have felt overjoyed to be alive and to have a healthy baby. 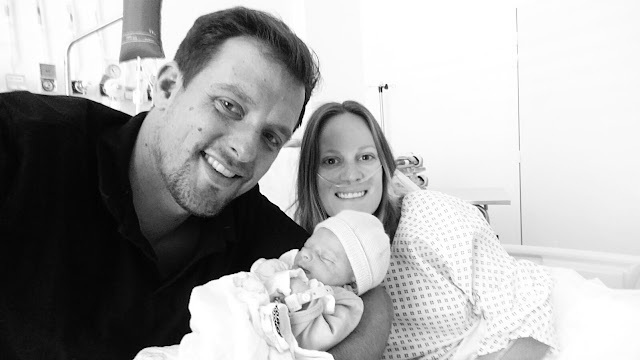 After meeting Oslo for the first time (which is now a blur and not a vivid memory for me), I was wheeled back to maternity with James and was greeted by doctors who were there to try their best to explain what had happened to me. During the last seconds of pushing Oslo out, I began shaking and all went black. What was happening was I began having an epileptic seizure, at the same time my blood pressure increased rapidly to 230/130, and I stopped breathing. Oslo wasn't completely born yet and as I began to convulse, my body was sucking him back in. The head midwife had given me an episiotomy during the first moments of pushing, so she had room to stick her hand in me and grab under Oslo's armpit. She grasped him and pulled him out just in time, as I lay on the bed with no life left in me. He was born at 12:20pm, just 20 minutes after I first arrived at the hospital. The doctors were called in and James was handed a healthy new baby and told to leave the room while they worked on me. He stood with our Oslo in his arms, terrified with the image of my lifeless blue body. He thought I was dead. What I can only imagine was the most horrific two hours later, a doctor came down the hallway and told him I was breathing but unstable, so I was put into an induced coma. James was then transferred to a maternity room with the baby and was left to nurture him alone, without me. For the next 4 days I stayed in bed in the ICU and received brain scans, had eye tests done, and extensive blood work to ensure I was healthy and didn't have any brain damage. They were left with few answers to give me, except I suddenly suffered from eclampsia. This was such a freak health scare without any preclamsia, they couldn't explain what had happened. We were frustrated without answers and no explanation as to how this could have happened. How can a perfectly healthy pregnant woman go from being stable and well to dying in seconds? This is a question that will forever be unanswered, and one that has taken this whole year to be at peace with. Everyday in the ICU was so difficult. I would wake up, lay in bed for hours and continue to ask the nurses when I can see my baby. I would ask until finally they would have a room available for me and I would get to see Oslo again, but only for a couple of hours each time. I felt like they were robbing me of those first extremely special days a mother should have with her baby. Finally after four days the doctor said I was well enough to be transferred to my maternity room and that I could be reunited with Oslo and James. Those were the best words I could have ever heard. I felt so relieved to be leaving the ICU, to know I didn't have any permanent damage, and that I could begin to be a mother. I spent another 4 days in maternity, slowly bonding with Oslo and recovering. The life had literally been taken from me, so the first few days I couldn't walk or even stand up without help. All my strength was stripped away. I continued getting regular testing for my blood and blood pressure which was still very high, but by day 8 I was in the clear. I could go home, finally. On my last night at the hospital I still had so many questions unanswered. I was so dizzy and fuzzy all the time and kept repeating questions to James, who was still dealing with all the trauma he had gone through. Before I was about to go to sleep the head midwife, the one who grabbed Oslo out of me and witnessed everything, came into my room, sat on my bed, and told me she was there to talk if I needed to. This was the most important thing she could have done to help me begin emotionally healing. I asked her question after question about what happened to me for the next hour. She was calm and strong, and just provided me the facts I needed to process what had happened. The last morning I was visited by the OBGYN, who was the first doctor on the scene when I stopped breathing. She wanted to say goodbye and to tell me my story will be one they will learn and grow from. She said in all of her years and deliveries, she had never witnessed what had happened to me before. She told me I was a miracle and lucky to be alive, and those words are ones I hold in my heart with me everyday now. Even to this day Oslo's birth and how it happened doesn't seem real. It seems more like a dream, until I get a flash from my memory. I still get extremely emotional and flooded with mixed feelings of joy and sadness when I think back to that day. On a day when I should look back and only feel incredible love and happiness, I'm still saddened that only part of me feels that way. The birth is my stolen moment with my baby. That is how the therapist I saw months after the birth described it to me. He hit the nail on the head so to speak, with the word 'stolen'. It was stolen, taken out of my hands, never to come back to me. I didn't get to pull my baby out and onto my chest, I didn't get to do skin to skin, I didn't get to look into James' eyes and share that first moment of our baby being born with him, and I didn't get to breastfeed right away. I did all the work of a natural labour for 25 hours, but received none of the rewards. This for me is the hardest thing I have had to overcome. The labour and delivery I had doesn't change the love I have for Oslo now. It just changed the initial emotions and feelings that are so necessary in the first fleeting moments with a new baby. I had a hard time for the first four months with bonding, feeling like Oslo was my baby, and breastfeeding. I really hate to admit that, especially because for so long it made me feel like a horrible mum. But I know now my story is special and difficult, and was out my hands. Now I feel like I handled it as well as I could have under the circumstances. I am proud of the strength James and I found together and separately to carry on and raise Oslo in this first year. It has been far more difficult and emotional than I could have ever imagined it. But because of what happened to us, it has strengthened us as a family and as a couple, which to me is the silver lining in this story. Oslo is the greatest thing that has ever happened to us and even though he did not enter the world as planned, he has changed our lives for the better. I love you baby Oslo. This post is so inspiring Jules, you really are incredible! You should feel really proud of yourself for sharing such a personal story and coming out of it so strong on the other side! You're an inspiration Mama!!! Oh and that photograph of Oslo is OH SO cute!!! This is an old post, and Im not sure how I found it (or your blog), but I wanted to say thank you for sharing and also let you know that you are not alone. While I have in no way experienced a birth as scary as yours, my first was about 40 hours long and like you I had terrible contractions while not being diluted. The people at the hospital (home birth was never an option for me, I wanted whatever drugs there are to handle the pain) never understood how exhausted I was when I got there and so it took way too long time before they helped. When my girl was born I was so exhausted I didn't even feel her slipping out, and I experienced none of those urges to push etc that people talk about. Compared to your story it's not as bad, but I felt like the feeling of giving birth was stolen, because afterwards I didn't feel like it was me that had given birth. 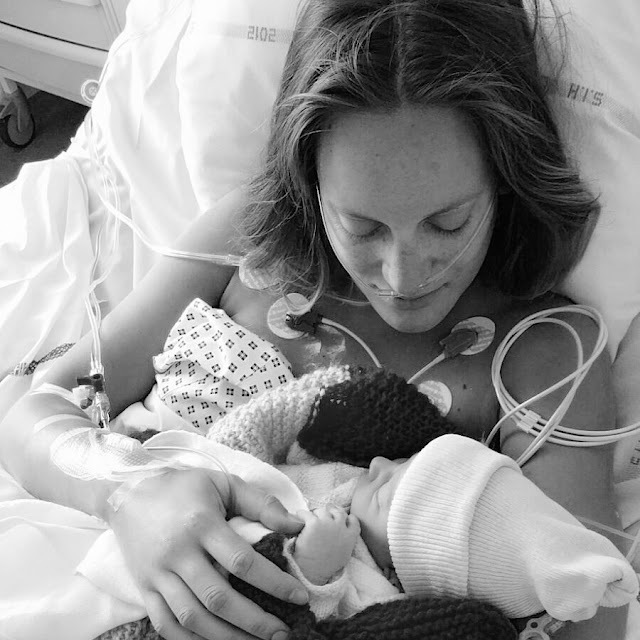 I healed eventually and the birth of my second child was a lot different, but it does help to share and I think it helps moms-to-be to read as many birth stories as possible, because one can never know what kind of birth it will be and also to remember that those first moments will be different for everybody. Few births are like the movies. I wish you good luck with your next birth, hopefully it will be a much better experience.